Do you own or work for a brand that sells physical products? If so, you might want to start utilizing one of Instagram’s newest features.. Shoppable Instagram Feeds! This new feature allows you to tag products in your Instagram photos that lead back to your website so viewers can click and buy whatever you’re selling, in a matter of seconds. This feature comes as a great surprise and welcomed change as most of us are used to Instagram’s lack of links. Normally, we get just one link in our bio which can sometimes be tough to get people to click. Now, with the addition of shoppable Instagram posts, we have the luxury of adding multiple links to a single image that lead our audiences directly back to our websites! Amazing! Shoppable Instagram images are denoted by a small shopping bag in the bottom left hand corner of the image (or in the top right when viewed from a profile). When these images are tapped, all of the products for sale will appear. The user can then simply tap on the product of interest which opens a new window with a short description, the price and a link to purchase via your website. If a user chooses to visit your website, you’ve just significantly decreased the gap from user to customer. Congrats! 5. Navigate back to your Facebook Page. You should now see a ‘shop’ tab on the left sidebar. Click that tab and select ‘set up shop’, then follow the instructions. *Note: keep in mind that while you can add services to your Facebook shop, Instagram will only allow you to tag real, physical products in your posts. 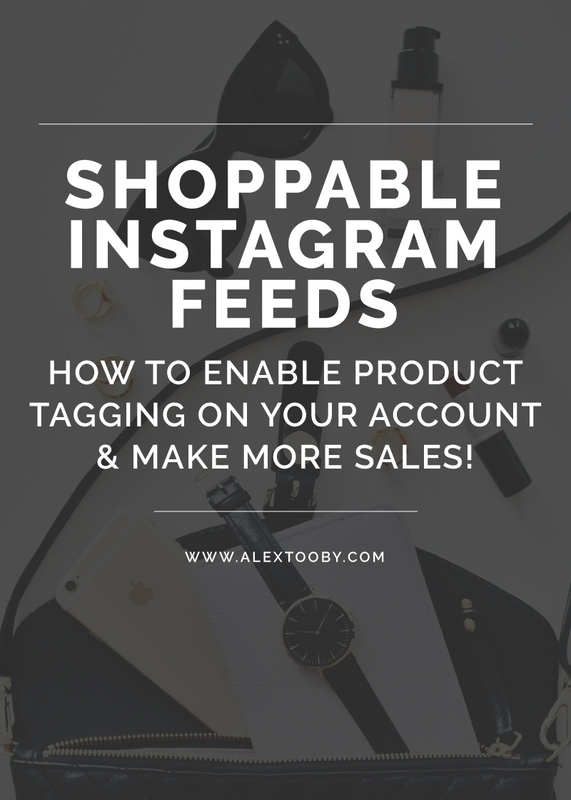 Now that you have all your products listed in your Facebook shop, we need to connect your shop to your Instagram so you can tag products and streamline the buying process for your audience! Once you have linked your Facebook page to your Instagram account, your shoppable Instagram capabilities will automatically be pending. You must wait until your account is approved before you can use the product tagging features. Instagram states this should take no longer than a few days. Woo! You’ve just successfully linked your “product catalog” (aka, the products added to your Facebook shop) to your Instagram account! Now, we’re finally ready to make your Instagram shoppable! *Note: if you don’t see the alert in the image above, navigate to your profile, select the settings cog and scroll down until you see ‘shopping’. If you don’t see that, your account has not been approved yet. 5. Share your new, shoppable Instagram image! *Note: when tagging products you cannot also tag profiles. That’s it! You can now tag your products in every photo that you upload to Instagram! I love this feature and think that it will really help business owners increase sales. But keep in mind that uploading a photo and tagging your products doesn’t guarantee anything. You still want to post quality content, write engaging captions, use call to actions and provide your audience real value! These are the things that really help you make more sales! What do you think of the shoppable Instagram feature? Will you be using it on your account? I’ve been trying to figure this out but have been frustrated with the different sources I was checking. Thank you for laying it out in the simplest way, I literally got everything up & running by the end of the post. You’re the best Alex! Hmm.. sorry to hear that Beth! Can you give me some more info about your account? How many followers do you have? what type of products are you selling? Yes! I just recently set-up my products in FB and Instagram. I love this new feature! Awesome! Are you noticing more people buying, or more inquiries? Will this integration still work if we choose not to checkout through Facebook? We offer over 4000 products (not counting variations), so I would only like to manually do this for temporary posts on promotions and redirect the traffic to the sale page on a company I manages website. Hi Alex! Great info. Thanks. I live in Ecuador, though so the feature is not available to me -yet- Any news as to when it will be available in other countries? Thanks for sharing this! Great tip. Hey Alex, I have been waiting for this function and I think it’s so amazing! So I just tried to set things up and in FB I get a message saying that having a shop on FB will no longer be supported unless I have an existing shop with Magento COmmerce Platform. WTF? Do you know anything about this? It seems so limiting. Wow that’s so weird! I have not seen or heard of that before.. What country are you in?? Maybe try starting over.. that seems peculiar because you should be able to have a facebook shop without being connected to anything! I so want to use this feature! I’m in Toronto and I have had a store with FB set up. Business account on IG and it doesn’t give me this feature for some reason. I wanted to follow your instructions along with the video yesterday and when I changed the settings a message saying that by the end of July this year any websites that are not on the Magento platform will no longer be supported. . One step forward, two steps back? I didn’t know this feature existed on Instagram! Thanks for sharing this with us! I hope to implement it on my account soon.